Hello, and welcome back to our blog here at Loukonen Bros Stone. In our last blog, we talked about several different types of patio material including flagstone and concrete. Since there are so many options out there for you to make your patio, it’s important that you pick a material that will fit within your budget and be beneficial to you for many years to come. Although concrete is the cheaper option, it doesn’t have the natural appeal that other patio material has. Additionally, cracks can form in it over time leading to costly repairs. 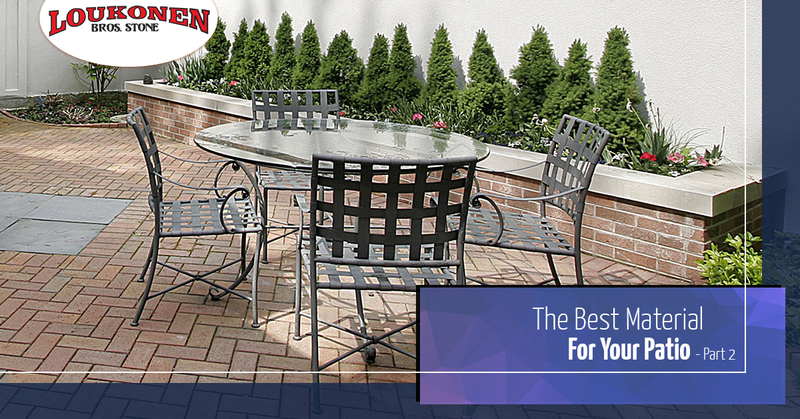 Be sure to take these things into consideration as you’re choosing your patio material. In this blog, we’re going to talk about several more patio materials including brick, pavers, and gravel. And if you have any further questions about building or maintaining a deck, speak with a stone supplier at Loukonen Bros Stone. We are one of the oldest and most respected stone suppliers in Colorado. Brick is a great option for your patio material if you want more of an old-timey look. It looks natural and is pretty easy to install. Unlike flagstone, however, brick will need to be replaced. Because brick is porous, it retains moisture that will damage it over time. It should also be scrubbed regularly with a brush and bleach solution in order to remove moss that can be a slipping hazard. If your brick patio is in the sun, moss will still grow, but it won’t be as big of a problem. Pavers are quickly becoming a very popular patio material due to how easy they are to put down and the low cost. Pavers are all the same thickness and they’re modular, so they look nice on just about any home and can be placed in just about any shape you need. Another benefit is the amount of color options available to you. Even in high-end homes, pavers are popular, and many people like to experiment with different colors of pavers to create a unique looking patio. One problem with pavers is that they will begin to spread away from each other over time, meaning there will be gaps in your patio. To avoid this, be sure to install some pressure-treated lumber around the outside of the pavers to prevent them from moving outwards. Like concrete, gravel is another patio material that will go down quickly and easily. There are two types that are typically available including crushed stone and river rock and can vary in diameter from a quarter-inch to one inch. Gravel will deter weed growth if there is a fabric landscape liner installed underneath and it offers better drainage in comparison to other patio materials. Gravel is a great option for some people, however, it’s not for everyone. If pulled off correctly, it can add a nice English cottage-style or Tuscan courtyard look to your yard. However, at its worst, gravel is high-maintenance and difficult to walk on. If you like to walk on your patio a lot, you may consider a more solid patio material like flagstone, brick, or pavers. Loukonen Bros Stone is your Top Rated Local® stone supplier in Longmont, Lyons, Boulder, Denver, and the entire front range. We are one of the oldest sandstone quarries in the United States and are committed to providing you or your company with some of the most high-quality and affordable stone in the area. We offer sandstone, flagstone, natural stone, decorative stones, patio slabs, patio pavers and much more. If you have any questions, give us a call today.